Is there a less suspicious hiding place for a spy camera than a smoke detector? Few will think twice if they even notice the smoke detector* look-alike. 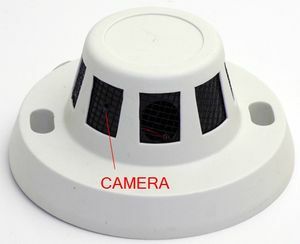 The electronics of the smoke detector have been replaced with a dependable high resolution side mounted camera that is perfect for monitoring doors or hallways. High resolution video. Records full color VGA quality (1280 x 960, 30 fps) video for displaying clearly on a monitor. The detector is powered by an internal Li-ion rechargeable battery and contains 16GB of internal memory.